Sometime during my lunch break yesterday, I had a revelation. I’ve been trying to cram so many projects into my Spring Palette Challenge, that it’s becoming more like work and less like fun. I have a 9-5 professional job, which I do enjoy. But coming home at the end of the day and playing (ie sewing, knitting, etc.) is 10x more fun to me. But I feel like I’m getting ‘numb’ from pushing myself so hard and working under a deadline, that this is sucking the fun out of it. What led to this revelation??? I came up with my very own semi-drafted dress pattern over this lunch break. And I started thinking, I can’t do it all… and led to the conclusion that I can either have quantity or I can have quality. So peeps, I have decided to go the quality route and churn out a few less pieces for my sew along than I originally had hoped to. This saddens me because I always want to cram in as much as possible, but I know my decision is for the best. I’m not much of an artist/drawer, but I managed to roughly capture my dress idea out on paper. I love the bodice of the macaron pattern, by Colette Patterns of course, but I personally feel like the skirt is not very attractive on my pear-shaped physique. I made this dress once before, and I’m not positive if it’s the style that’s not good for me or the fabric (or a mixture of these). 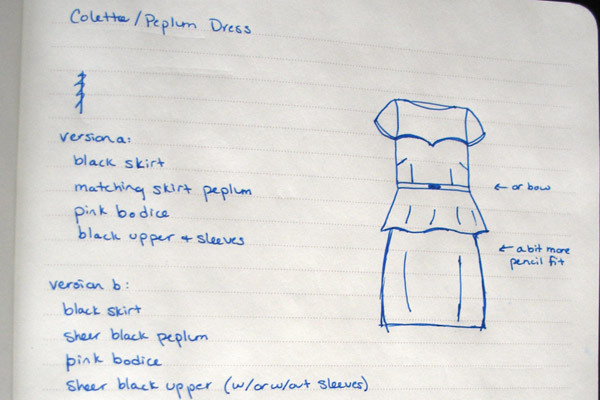 Either way, I’m revamping my Macaron pattern to have a peplum-pencil skirt!!! I’m really quite pleased that I was able to actually draw what I was envisioning for once, since my drawing ability is normally limited to stick figures. Also you can see I started coming up with potential fabric variations also. But for me the winner is version C (below). Pink Lace Upper & Bodice, Pink cotton underlay on bodice, Pink peplum in lace (no underlay), Black Skirt, black belt. And I also have some optional bow details for the sleeves and the belt. I really want this to be a spring/summer dress, something I could wear during the day even. So version A with the black upper I felt was going to be too dark, and Version B with a sheer black upper bodice piece is going to be too dressy for daytime use. Being a beginner sewer, I’ve never actually combined two separate patterns together before, to create something new. I’ve always just found the patterns I wanted to use and made them as-is, with little to no modifications. This is challenge #1. The bigger challenge will be finding the perfect lace and sewing it. I haven’t worked with any kind of lace before, so this in itself is going to be a huge, yet fun challenge. I’m trying not to think about it, and just ‘do’ since I don’t want to psych myself out. But I’m more concerned with finding that perfect style of lace. I’m not really a chantilly lace type of girl. I like things that are a bit more art-deco and therefore lean towards more alternative laces or embroidered fabrics. This coupled with the fact that I’m on a budget will be challenge #2. I’m trying to remain positive since I’ve never shopped in the lace department before, so I can’t attest to what’s out here in Chicago. Luckily, I’m due to go fabric shopping with my mom on Sunday, and I’m very excited to say the least. So I’ll be on the hunt for some pretty embroidered/lace fabric and some smashing black fabric for the skirt portion. I can’t wait to get started…. What do you guys think? Do you think lace a good or bad idea? And what do you think of my color combos? Pretty or hideous? I think it’s perfectly reasonable to change your plans. Sewing should always be done for pleasure, so if you know you will get more fun and satisfaction from a smaller, better quality capsule, then that’s great. I’m sure your (self-designed!) dress will look fab, it sounds really good. Thanks so much for the extra vote of confidence; the more I think about it the more I feel like I’ve made the right decision. I totally agree, quality wins over quantity every time. I really love your drafted dress! I’m on the fence about lace in general, but it all depends on the pattern of it, some are beautiful while I find others a bit dowdy. I think an eyelet fabric would be adorable as well. I do love your idea of the peplum! I look forward to seeing your dress come together! Good luck! Thanks so much for your comment. It helps to hear that others think I made the right choice. Eyelet is a great idea. I could see having the eyelet’s scalloped edge being really cute as the bottom edge of the peplum. I’m still hoping to find a cute lace, but eyelet is a great 2nd option.